Manaslu Circuit Trek Distance does vary upon different conditions. Depending on factors like the start and end point of your trek, your distance of this trek can differ. 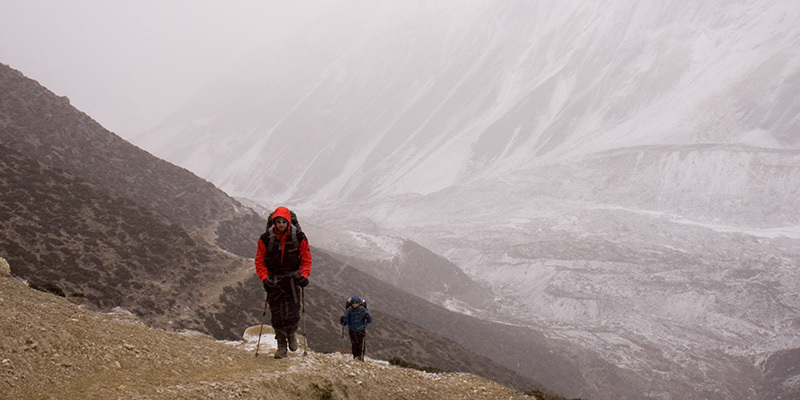 The average total distance of Manaslu Circuit trek is 177 km. This unique trek offers all the scenery and experience a trek to Nepal encompasses. 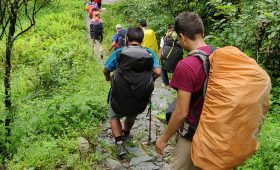 Manaslu Circuit Trek takes you through the subtropical forests of the lower regions to the foothills of the Himalayas. It also includes crossing of one of the most dramatic passes in the Himalayas of Nepal, Larkya La Pass. 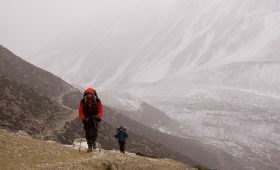 As you will be walking in the rugged pathways for 21 days along the trails of the Manaslu region, you must be very careful about the packing for this trek. With proper packing, you can easily overcome any difficulties or the longer trails. There are beautiful areas in and around Manaslu region like Tsum Valley. And, you can make a side trip to these hidden valleys to explore more in the Manaslu region. If you opt for this side trip your overall Manaslu Circuit trek distance also increases. To better understand the distance of Manaslu Circuit Trek, here is a day by day breakdown. Your Manaslu Circuit trek starts after a drive from Kathmandu to the trailhead. Depending on the itinerary you choose, the actual trailhead differs and so does the total distance of the trek. Plus, your walking distance also increases with your acclimatization hikes or the extension of your trek due to physical problems en route. Given below is the distance traveled in each day during your Manaslu Circuit Trek. Arughat bazaar is the place where your actual trek on foot begins. It is 138 km from Kathmandu. It takes 6-12 hours to reach by different modes of land transportation. This variation in time is due to the difference in the mode of transportation and the traffic you face. The first day of trek starts from Arughat and ends in Soti Khola. You will trek a total distance of 12.9km. This takes an average of 5 hours. Machha Khola is around 23 km from Soti Khola. It is around 5 hours of trek. You will cover a distance of 22.89 km on this day. On this day, the walk may take longer. This may have to do more with the beautiful scenery than the conditions of the trails. Once you leave Machha Khola, you will walk through dense Sal forest. You can explore the beautiful waterfalls and rivers. You will also cross a suspension bridge today. You can see the beautiful rice fields of the region. You will also walk through the quaint Gurung villages of Lapubesi and Khorla Besi. Another attraction of this place is the hot-spring, Tatopani. Do take some time to soak in the hot spring. It is a great way to loosen your muscles. Locals also believe the hot spring has medicinal values. The soak also prepares you for the steps that are to come. You will climb the stone staircase named Thado Baryang on this day. Jagat village is the entry checkpoint of Manaslu Conservation Area. The total distance from Jagat to Deng is 20.67 km. You will trek through the beautiful rivers of Ghatta Khola and Deng Khola. You will also trek through the beautiful bamboo forests of the region. The distance trekked on this day is 19.4 km. Yet this 6-hour trek can be difficult with steep climbs and winding forests. But, you will get amazing views of mountain peaks like Siring Himal and beautiful Mani walls. In the evening, you can choose to rest or explore the beautiful village of Namrung. This is one of the shorter distances trekked in a day. You will only trek 10.54 km on this day. This distance takes around 4 hours to complete. You will pass the beautiful villages of Lhi, Sho, Simnag and Lho. You can choose to explore this village or skip it and rest in the afternoon. This part of the trek is famous for its chortens and barley terraces. They make for beautiful sights and a sense of peace. From Lho and onwards, you can enjoy extraordinary views of Mt. Manaslu. You can also explore the famous Ribung Gompa. From here you trek to Shyala village. Here, mountains like Himal Chuli and Peak 29 (Ngadi Chuli), Manaslu, Ganesh Himal surrounds you. You can also see large glaciers. This is a short day of trekking of only 2 hours. You cover around 17.51km. Hence, you can enjoy the views at leisure. You will trek down to the Budhi Gandaki river. This is an easy day of the trek. You pass a beautiful forest of juniper and birch forests. You can cover the total distance of 16.4 km within 4 hours. Dharmasala is also known as Larkya Phedi. It is 12.45 km from Samdo. You start today’s trek by crossing the wooden bridge over Budhi Gandaki river. You come across several streams along the way. You can also see prayers flags fluttering in the wind and Mani walls. The view of Larkya Glacier is the highlight of today’s trek. Its magnificent beauty will definitely leave an impression. You can take your time to enjoy the views on offer. This day is a short 4-hour walk. Hence, you have the freedom to trek at leisure. This is a long day of walking. You will cover 24. 9 km of distance today. You will also be crossing the dramatic Larkya La Pass on this day. 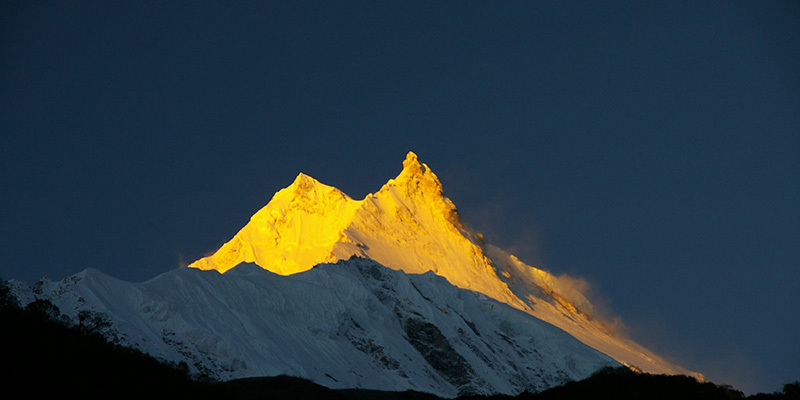 Larkya La Pass at 5169m, the highest point of the Manaslu trek also offers the best views. On clear days, you can see magnificent mountain peaks of Himlung Himal, Annapurna II, Cheo Himal Kang Guru. After breakfast in Bumthang, you will head out to a nearby ridge. From here, you can enjoy great views of Manaslu and other mountain peaks. After walking for 5 hours, you will reach the beautiful village of Goa. Today, you cross different bridges over the majestic rivers like Dudh Khola and Marsyangdi Khola. ‘Khola’ means river in the Nepali language. After passing through several mani walls, you reach ‘Tal’, your destination for the day. Today is also the day you enter Annapurna Conservation Area. The trails get busier from hereon. You follow the popular Annapurna circuit trails from here. You cross beautiful villages of Gheru, Jagat and Chamje. The distance of 14 km takes around 5 hours to complete. Beautiful views of the mountains and the surrounding villages, you go through lush green landscapes. You will start with ascending steps and walk around 5 hours. Yet this hours will pass quickly as the views change. The total distance you need to cover is 24.9 km. Besisahar is the end of your actual trek on foot. Besisahar is the end of your trek on foot. From here, you can take different modes of transportation to Kathmandu. Depending on your mode of transportation and traffic, it takes 6-8 hours to reach Kathmandu. You will travel 186 km. 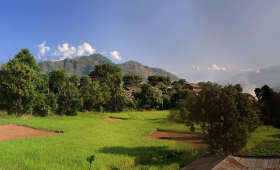 On the way, you can enjoy majestic views of the rich Trishuli river. You can also view terrace farms, mountain scenery, forests. Instead of trekking from Arughat to Soti Khola, you can choose to drive there. Instead of hiring a vehicle till Arughat, you can hire it all the way to Soti Khola. This reduces a day of trekking and reduces around 13 km from your Manaslu Circuit Trek. From Kathmandu, you will drive west along the Kathmandu – Pokhara highway. You pass through beautiful villages, some small towns, terrace farms and lush hillsides. You can also catch glimpses of mountains like Annapurna, Manaslu, Ganesh Himal, and Langtang Himal. The drive covers 141.3 km. It takes you through well-maintained highways to dusty dirt tracks. Be prepared for a bumpy ride. This side trip to Tsum Valley is a fantastic option to explore the least known corners of Manaslu region. It is a fantastic side trip to the remote and well-preserved region of Tsum. It adds 2-3 extra days to your itinerary. The extra distance is also well worth it. 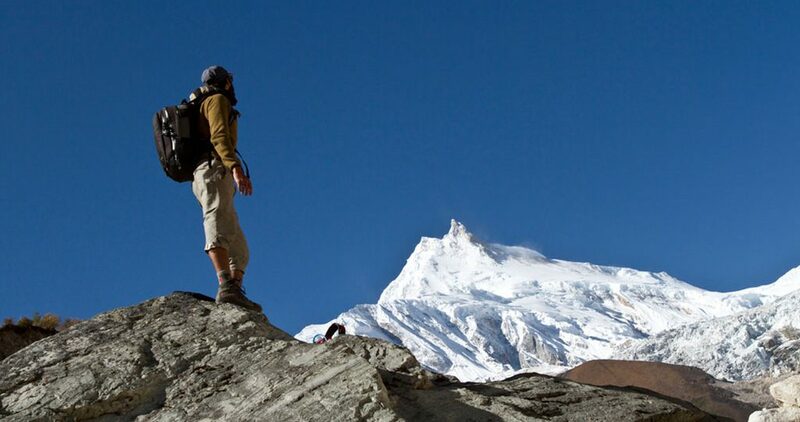 The Manaslu Circuit Trek is a moderate to strenuous level trek through the unspoilt regions of Manaslu. The Manaslu Circuit Trek distance breakdown follows a standard itinerary. It can vary depending on the choice of route, the tour agency and guide you hire. You can contact us to help you personalize your own itinerary as well. You can also contact us for any further query you may have of Manaslu Circuit trek or any other trek or tour in Nepal.